Writers have an abundance of avenues for self-publishing their work, with Amazon and SmashWords perhaps being the two most prominent. So when I was first clued in to TowerBabel, an online eBook self-publishing platform founded in 2013, I was admittedly a bit skeptical. I mean, between Amazon and SmashWords, that's it, right? What more do you need? But after investigating the website further, I think TowerBabel is definitely worth a look. Why? Primarily, because TowerBabel is not just a self-pubbing platform, but rather a burgeoning community dedicated to writing and reading. And we here at LitReactor wouldn't know a thing about that! Our vision is that one day, whether you are a writer, storyteller, editor, illustrator, book cover design artist, proofreader, etc, you can all come to one platform to create, collaborate and self publish your works. Our readers can then discover, curate and interact with the content they love. That little comment bubble with "0" inside is (you guessed it) a comments box, which you can use to make notes as you read. Similar, of course, to the annotation capabilities of Kindle, iBooks and other eReaders, with one downside: you can't make comments anywhere in the text, only in those pre-installed comments boxes, which appear at the beginning of each paragraph. Still, the reading function is fluid, and because it's all online, you don't have to worry about bogging down your precious storage space with yet another free eBook (though, of course, if your internet connection is nonexistent, no reading for you!). You can add books to a queue for later viewing as well. 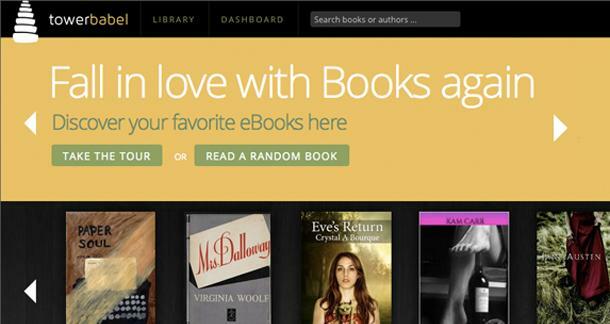 The free eBooks are a nice touch, but they're definitely not TowerBabel's main attraction. And it may seem arbitrary to include classic works of literature alongside self-published works, but really, it isn't, when you consider that: one, it's pretty much the same with Amazon; and two, the larger goals behind the site, which are more or less spelled out by its logo and name. Recall the "Tower of Babel" story, which, in a nutshell, asserts that there was a city with people who all spoke the same language, and had built a tower that would reach the heavens. God didn't like this for some reason (God's a bit of a fuddy-duddy in the Old Testament), so he scattered the languages and made it so people could no longer understand each other (again, for some reason). Linguistics play a central role in shaping the various myths, customs and cultures in the history of mankind, according to Claude Levi-Strauss (the French anthropologist who also heavily influenced me). These cultures, although different in forms, share an underlying structure universal to all societies. E.g. there is always some kind of binary and symbolic relations (Life vs Death, Fire vs Ice, Master vs Slave, Husband vs Wife and so on). ...My vision of TowerBabel is not to unify all these values but to bring them together. Because if we unify everything, we destroy diversity, and in turn destroy creativity...We want to see both diversity, inclusiveness and collaboration happen on TowerBabel. Also, it is indeed a reference to Neal Stephenson's Snow Crash. So how do you get involved with this digital cultural meet-up? Like all things online these days, you just need to set up an account, which is free, then upload your content. 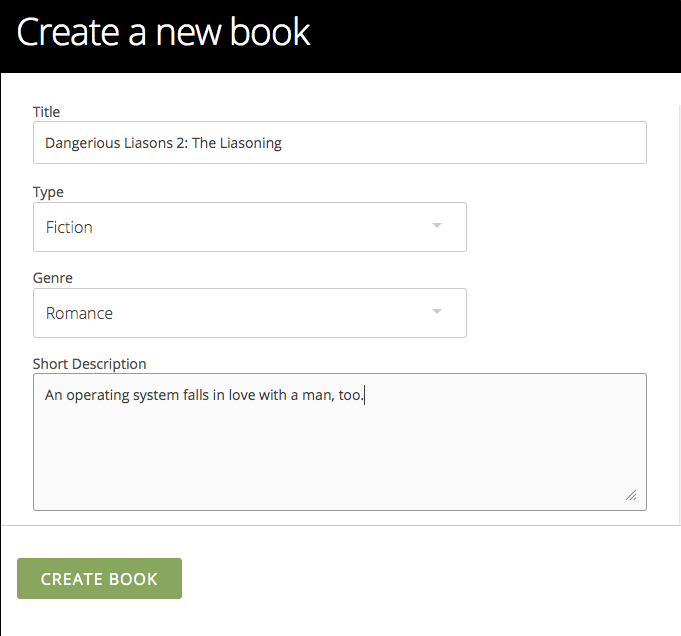 As you can see, I created a book called Dangerous Liasons 2: The Liasoning (with "liaison" misspelled, nice touch!). From there, you can upload a manuscript from TXT, DOC, DOCX, RTF or ODS file, write new chapters as you go (and utilize the collaboration features, if you wish), or import your book from your external website's feed. So if you're a blogger looking to self-publish your writings in eBook format, you have a quick and easy option to do so here. I did have some trouble uploading a cover photo for my fake book, and couldn't find a help or FAQ page with image guidelines, but for the time you could simply email contact@towerbabel.com, and I'm sure the support team would help you out (I didn't personally pursue the matter further, because again, my sequel to Dangerous "Liasons" isn't real). TowerBabel asks for non-exclusive rights, so you're free to self-publish anywhere else you like, thus spreading your name far and wide. You could even utilize the service as a promotional tool, publishing free excerpts of your work there, with links to buy elsewhere. For more information on TowerBabel, take a tour of the site here. So what do you think? 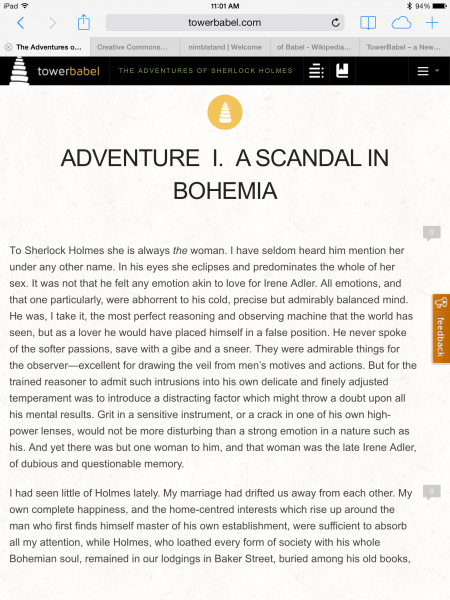 Does TowerBabel sound like something you'd use for your self-publishing endeavors? What about for non-author pursuits, like family albums or extended blogs/journals? Let us know your opinions in the comments section. It's pretty, but when I saw the Sherlock excerpt, I couldn't believe there were no paragraph indents. So I went to TowerBabel, and looked at a few random books. Nope, none! While I like the overall formatting (green boxes for bullet/numbered lists, clean margins and no up/down scolling), I think the lack of indents will make long lines of dialog look clunky and messy. A cool platform, but I don't know what's inherently different from it and Wattpad, except Wattpad is a password protected community (so you don't lose first rights), and the audience may be a little older. Thanks for the comment. 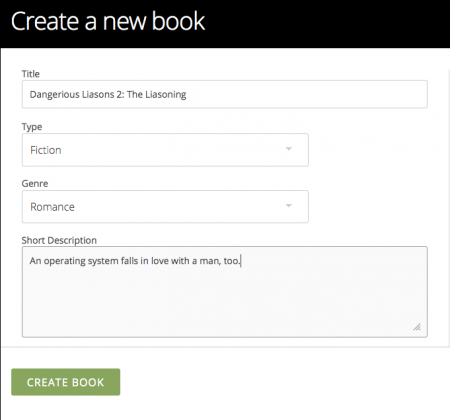 We do support paragraph indents and various formatting options if you create the book from our editor. The public domain books are sourced from Project Gutenberg and the formatting of the ePub file sometimes isn’t consistent, but we will try our best to edit them and make the reading experience fluid. Wattpad is a great site and they have been around for a long time, and their genre and audience are very YA and Romance centric. What we strive to differ is the focus on collaboration and rich media storytelling, with a more "professional" touch. We are still at an early stage. There are a lot of cool things we hope to do, but we need the support of the community, so we can constantly improve our product based on your feedbacks.